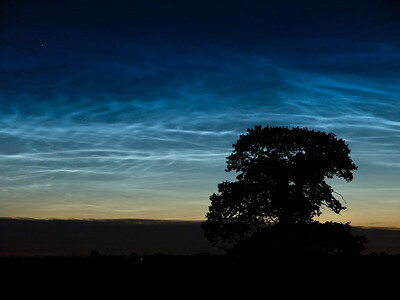 Stunning and rarely witnessed Noctilucent or "Night Shining Clouds". 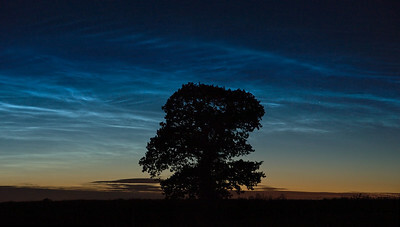 Midnight darkness turns to day from the glow of noctilucent clouds. The shimmering clouds form at an altitude of around 55 miles above sea level and are made up of tiny ice droplets. Because they are so high up in the atmosphere the sun is able to illuminate the clouds from below the horizon. 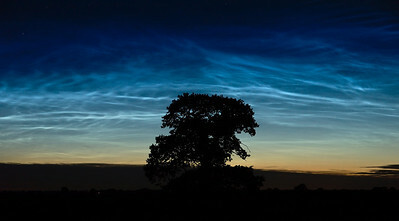 Called 'noctilucent' clouds, which literally means 'night-shining' in Latin, they are normally spotted in polar regions during the summer months. Noctilucent cloud formations are the highest on Earth where temperatures can plunge below -130C (-200F) and winds peak at 300mph. They appear in the mesosphere, which is between 30miles and 50miles above the Earth's surface. Clouds are made up of ice crystals and scientists are baffled as to how these form in an arid layer that is several million times drier than the Sahara Desert. But their prevalence in the summer months might be one clue. Upwelling winds in the summertime carry water vapor from the moist lower atmosphere toward the mesosphere. Apparently the water droplets also need dust particles to stick to to create the ice crystals. This could explain why the phenomenon was first recorded in 1885, two years after the Krakatoa eruption, when several tonnes of carbon dioxide, ash and dust were emitted into the atmosphere. 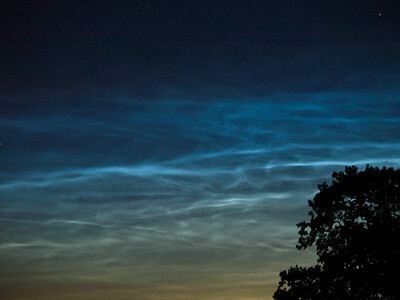 However scientists do not know why the clouds have become more common since then rather than fading away. They have speculated that debris from space may be the answer. July 09 2010. 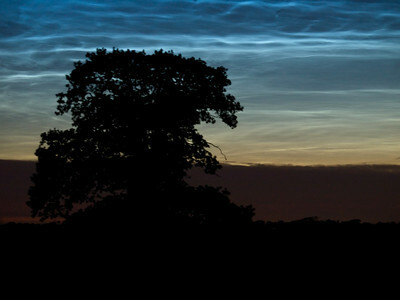 Stunning Noctilucent display and the best thus far I have ever witnessed. The early evening display commenced about 2230hrs and maintained good overhead visibility before dwindling on the low northern horizon at approx 0100hrs on July 10th. At its peak the display must have been close to 70 deg above horizon, almost directly overhead. It was full of mesmorising waves and crooked curves and sustained a very deep electric blue colour. Once again summer skies were temporarily turned into daylight. A brilliant evening. Captured with Oly E3 and combination of 12-60mm/50-200mm SWD lenses. Fastest aperture, all 2.5s and ISO 320. 18 June 2010. 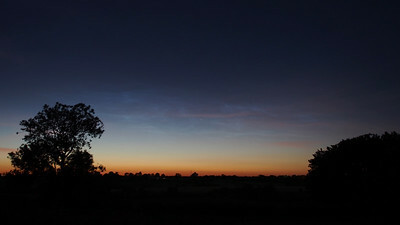 The 2010 Noctilucent season has begun. First decent sightings of the year from the early hours of this morning (0100hrs) in Lutterworth, Leics. Not a bad dispaly which lasted for about an hour. Night turned to day for a brief period. Captured with Olympus E3, 50-200mm. F3.2, 10s, ISO 200. Panorama stitch of 3 mages.